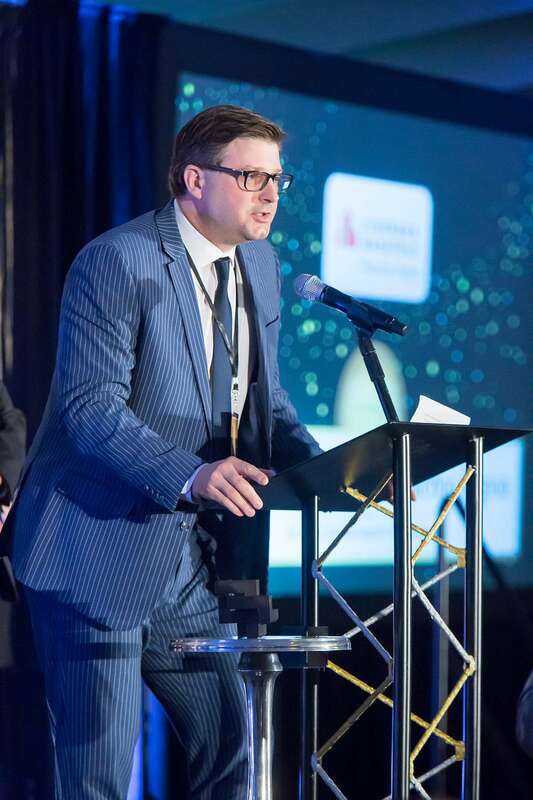 Cushman & Wakefield Waterloo Region Ltd., Brokerage was pleased to receive the 2018 Greater Kitchener Waterloo Chamber of Commerce ‘Business of the Year’ Award (11-50 employees) at the annual gala event featuring outstanding local business. The Annual Business Excellence Awards Gala is the Chamber’s premier event and a must-attend night for business owners in the Kitchener-Waterloo Region. The Gala is a celebration of business excellence, recognizing Chamber members who have made exceptional contributions through their involvement and leadership in the community. Cushman & Wakefield’s Waterloo Region brokerage success is due, in no small part to its local ownership, which knows how unique the commercial real estate market is in Kitchener-Waterloo, Cambridge, Guelph and Southwestern Ontario. “We endeavour to serve our commercial real estate clients and the business community in Kitchener-Waterloo with highly specialized commercial real estate sales and leasing knowledge across key asset classes including, office, industrial/manufacturing, land development, retail services, and investment opportunities”, said Michael Polzl, President & Broker of Record. Attracting good people with good business practices is fundamental to our client service mandate. As a result of this fundamental principle, the Kitchener-Waterloo office has accomplished exponential employment growth beginning in 2012. Since the company’s primary hiring phase, we have experienced 725% employee growth, from 4 to 33 employees in 5 years, with growth set to continue in all areas into 2018 approaching our 7th year of business operations under the Cushman & Wakefield brand. In 2017, our real estate practice groups became regional leaders in their respective fields. As of December 2017, our retail team is leading the market for Kitchener, Waterloo, Cambridge and Guelph with strong market share among our national competitors. Locally, we have a full-service office servicing industrial, warehousing, office leasing, investment sale, retail leasing opportunities, land developments, and self-storage commercial real estate. Like that of the Kitchener-Waterloo Chamber of Commerce, Cushman & Wakefield Waterloo Region is a champion for community and regional prosperity. We understand and appreciate the impact we can make and encourage our professionals to involve themselves in public and charitable service; give their time and expertise to local community groups and voluntary organizations; build long-term relationships with suppliers and support small and local businesses; and to work together with charities and create a partnership that is in tune with our business values.